In drug discovery, advanced formulation development systems can play a critical role in moving medical science forward. Management consultants CRA International say a company can expect to spend up to $1.6 billion (£1.3 billion) for market introduction of a drug containing a new active ingredient. The development process can take 12 years and time and cost efficiency are crucial factors in getting profitability to market. A drug company may evaluate up to two million compounds, to find a single active ingredient makes it into the final formulation. It is not surprising then that automation in chemistry and pharma labs began with active ingredient research, back in the 1980s, but it has since spread to formulation development and all sorts of other lab tasks. The robotic arm in the process of of cleaning the rheometer measuring system. Over decades, chemical and pharma lab technicians developed and studied their samples in numerous manual trials. Automation simplified operations and significantly increased the reproducibility. The drudgery and time required for manual labour can be reduced or cut entirely, with millions of reactions and experiments set on auto-pilot. ‘Clinical laboratories were pioneers in adoption of lab automation. Forensic, food and agriculture, genomics and proteomics are the application areas which promise to fuel the growth of this market,’ explains research analyst Nikhil Kaitwade at Future Market Insights, which will shortly produce a report on the lab automation sector. For now, companies across sectors such as pharmaceutical, clinical, biotech and chemical are the main customers. Prominent firms in the market include Bosch, Anton Paar, Thermo Fisher Scientific, Labman, Siemens Healthcare, Synchron Lab Automation, Hamilton Robotics, and PAA Automation, says Kaitwade. Drug discovery workflows require technologies that can support a wide range of current and future applications such as multiple microplate formats, liquid transfer and detection-based read-out methods, says Mark Dupal, portfolio director of microfluidics and automation at PerkinElmer. He highlights PerkinElmer’s Automated Integration Business as a platform that is designed to help customers automate a wide range of these diverse scientific processes. The instrument can also be culturing cells, dispensing compounds and re-arraying compounds at the same time. ‘One unit could be doing the work of two full-time employees in certain workflows,’ says Dupal. North America and Europe lead the market in lab automation because of increased take-up in pharma and biotech companies, clinical diagnostics, clinical research institutes and contract research organisations. Total lab automation solutions are more prevalent in European labs, with many moving onto their second or even third generation systems, Franz Walt – president of laboratory diagnostics at Siemens Healthcare – recently noted. As an example, he discussed the Hospital Clinic de Barcelona and its Biomedical Diagnostic Center, which processes half a million orders from hospital patients each year. Investment in automation enabled the lab to support 5% annual growth, while keeping its budget for reagents flat. A growing demand for diagnostic testing, together with a shrinking labour force of laboratory professionals, is driving further adoption of automation. It is a trend that can be expected to continue: an estimated 60–70% of all diagnostic and treatment decisions, hospital admission and patient discharge are based on lab tests results. ‘Customers are seeking full workflow solutions,’ says Dupal. He says automated robotic offerings can enable complex workflows in multiple research disciplines, such as Crispr analysis, synthetic biology, high throughput screening, genomic DNA extraction, lifestyle DNA analysis and long-term stem cell differentiation analysis. But lab automation for formulation development has also moved on to coatings and paint and then to cosmetics, crop science and adhesives, involving products such as varnishes, pesticides or glues. More recently, pharmaceutical formulation development is now joining in, says Thomas Brinz at Bosch. Research with customers indicates that lab process automation in the chemical industry can more than double lab efficiency, generating time and cost savings, he adds. You can choose between modular systems or complete robotic platforms to suit a variety of simple or complex development processes. An Achema trends report highlights how Chemspeed Technologies supplies full kits of modular systems. The company’s liquid- and solid-phase robot speeds up synthesis by a factor of up to 1000. Its patented innovations for the chemical industry include overhead gravimetric dispensing of solids, liquids, paste and wax in combination with high-precision reactor, formulation vessel, application and test technologies. Precision dosing of solids, liquids and gels is now feasible, a feature essential for preparing many mixtures required in healthcare or chemical industries. Brinz, a chemist working on new materials in Bosch, began a project looking at the development of new formulations and materials over 10 years ago. ‘The automation equipment available at that point was mainly coming from pharmaceutical drug research and wasn’t able to handle material formulations and paints,’ he says. Begun as a startup in Bosch Venture Capital, Bosch Lab Systems was absorbed into Bosch Packaging Technology in 2006. As laboratories continuously automate their processes, the need for individual solutions and complex special-purpose machinery is moving up a notch. Bosch Packaging Technology now develops and markets high-throughput technologies and lab automation for a fast and efficient development of new materials and formulas. Other key players in the lab automation market include Abbott Diagnostics, Biotek Instruments, Agilent Technologies, PerkinElmer, Siemens Healthcare and Fisher Scientific. Rheology is the study of flow and deformation of matter, measuring the elastic behavior of materials – how gooey things are. For example, adjusting the rheology of ice cream makes it melt more slowly and feel less cold in your mouth. Typical customers for Anton Paar rheometers and viscometers include Uniliver and Proctor & Gamble, with products such as detergents, shampoos, coatings, paints, inks, petrochemicals and agrochemicals. BASF, Shell and Syngenta are customers to. Clients can opt for a more basic preset high-throughput rheometer or a bespoke version and they can go to the company’s automation department to join different instruments. For Bosch Packaging Technology, clients can choose an integrated lab station, which is for companies interested in high throughput experimentation and screening, or a compact lab station, suitable for entry into high throughput experimentation. A critical component is its BLS Syringe, which allows dosing of a broad range of liquids, creams and pastes. Conventional dosing systems rely on individual devices for high and low viscosity and need regular cleaning, according to Bosch. Its syringe can handle all kinds of liquid and paste-like formulations, from paints to adhesives to cosmetics and agrichemicals. It can do in-line determination of density of the formulated materials. Coatings firm Wörwag took on a prototype of the Bosch system in 2006. This family company sells coatings, but with specifications from customers defined on a coated panel. ‘So we always have to check the properties of our coatings on a test panel,’ Sabine Ansorge explains. The machine’s capacity is 128 different formulations on a 24-hour running time, ‘versus about 10 formulations in the traditional lab work for one worker per day’, says Ansorge. Originally developed for the chemical industry, Bosch says it can usher in benefits to pharma labs and, along with powder formulation, forms the basis for its formulation technology. Traditional dosing technologies apply liquids by sucking in the material, posing challenges for media with high viscosity. The BLS syringe facilitates this procedure, because its cylinder can absorb media with different textures and uses a piston with separate outflow. ‘This is the core of our high throughput formulation technology,’ says Brinz, and the company shows this off in a video of its Compact Lab Station at work. A formulation station contains a syringe which mixes together doses of a base paint, gravimetrically controlled, before adding solvent, paste and a defined mass of powder. A stirrer ensures thorough mixing. ‘It’s also important in this system that you schedule stirring correctly, otherwise the liquids or powder mix might agglomerate,’ Brinz explains. ‘You get really perfect formulation, without any big particles, and you can do a rheology measurement and adjust for viscosity, all while dosing under stirring.’ This compact lab system is frequently used by small and medium enterprises. The experiments were done with paints, but the technical issues are the same no matter what the brew. ‘Formulation is a very generic process, and that is a big advantage with these technologies. You dose powders, you dose liquids, so it is really independent of what you prepare, be that adhesives, coatings or crop chemicals,’ says Brinz. His company’s Integrated Lab Station is a much bigger beast and used especially by big chemical companies. It can comprise up to 50 modules and could have a 2m2 spray station or a 22m long station. The compact lab station offers the advantage of a modular build-up in a company’s capabilities. Automation saves time and frees labs from their typical 9 to 5 shift. Goodyer says that Unilever had three lab operatives working on rheology instruments every day but now 40 samples can simply be placed into the one instrument or 300 samples lined up for automation on a Friday night, ready Monday morning. 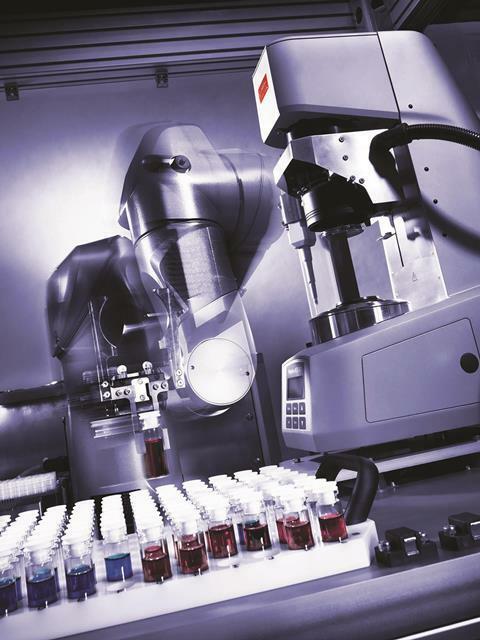 Procter & Gamble installed a HTR in the summer of 2010 and describes it as a standalone rheometer with a robot. 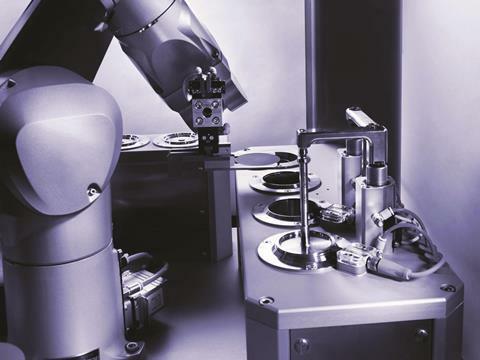 Once loaded, a robotic arm swings between the sample magazine, the rheometer and the cleaning unit. It runs overnight, with 96 samples of detergent or whatever else ready for lab staff in the morning. At the Procter & Gamble innovation centre in Belgium, the head of its measurement group was especially impressed by its flexibility and range of temperatures it could test, down to –5°C. Automation allows companies run 24-hour operation and it’s a robot doing the same thing so you get good reproducibility and reliability,’ says Goodyer. Anton Paar’s HTR promises shorter development times and to free up skilled employees for research. ‘Some have used our automation department to build bespoke instruments that don’t include any of our own,’ says Goodyear, giving the example of rubber tire tests as a recent such example. A recent analyst report predicts that the global automation market is poised to grow further ‘owing to drivers such as shortage of skilled lab personnel in developed countries, cost effectiveness over manual lab procedures, increasingly stringent control on research activities by regulators’. Some of the industry experts also emphasise low error rates, the report’s synopsis notes. However, Conway says the downsides of automation are worthy of reflection too. ‘One thing that comes from automation is removal of the human and you then have to ask where is the innovation going to come from. Capturing human intuition and reactivity is a really important part of the discovery process and that should be discussed as part of our approach to automation,’ he suggests. The lab automation market is expected to reach USD 5.20 Billion by 2022 from an estimated USD 4.06 Billion in 2017, at a CAGR of 5.1%. Factors such as process miniaturization, high demand for lab automation equipment in drug discovery and clinical diagnostics, higher reproducibility and accuracy, and large workforce demand and supply gap are likely to drive the growth of this market.